Every summer, hundreds of hockey camps are operating all over North America. And no matter what skills your hockey-playing child needs to work on, there are camps out there for you. There are camps for speed, camps for stick handling, camps for shooting, camps for checking, camps for “power” skating, camps for defensemen, etc. Most of these camps are week-long camps, and with each camp comes the promise of positive results. So my question is: If positive results can come from attending a 1-week hockey camp, what kind of results could you expect from 37 weeks of hockey camp? Before talking about how you can get 37 weeks of hockey camp (I'll get to that below), here's some food for thought, not only about summer hockey camps, but also about maximizing the development of your hockey-playing child. While your son may derive some value from attending a week-long camp (see Youth Hockey Development - Part 1), it is definitely NOT the best way for a youth hockey player to develop. By day 2 or 3 at most week-long camps, nearly all the players are fatigued. The fact is: there is a better way. 2. Hockey is a game of skills. Hockey, first and foremost, is a game of skills. Brute force alone does NOT make a hockey player. Strength and power do matter, and they matter very much as players move up the pyramid to higher and higher levels of hockey. But youth hockey development is primarily about skill development. It is about developing proper techniques so that strength and power CAN be applied to those skills later. 3. Skills can only be developed properly when there is no fatigue. Look at any skill, and experts who teach that skill will tell you unequivocally that the skill cannot be developed, much less mastered, while the “student” is fatigued. This is true not only for youth hockey skills but also for something like mastering a musical instrument. It is true for baseball players and golfers, for gymnasts and figure skaters, for pole vaulters and high hurdlers. And on and on, for all skill-based activities. No matter the skill, if fatigue has set in, you are better off NOT practicing. 4. Proper technique is the key to skill development. The key to mastering any skill is proper technique. And, as stated above, proper technique can only be maintained when the athlete is not fatigued. This is because all skills involve the use and/or mastery of fine motor skills. The execution of most skills also requires the coordination of two or more physical activities simultaneously. For example, if you hope to play the guitar well, your left and right hands must work together. And of course in a sport like hockey, which requires the use of almost every muscle in the body at all times, the athlete must coordinate not only both hands, but also both feet, as well as the elbows, shoulders, hips, knees and head. 5. But proper technique is even more important than meets the eye. To execute any athletic skill at the higher levels, the athlete must be able to apply power and strength to the skill. But if the technique the athlete is using while attempting to execute the skill is flawed, then at some point strength will overpower the technique. And when that happens, the skill breaks down. For example, a baseball player hoping to hit major league pitching must be able to swing the bat faster while still keeping the swing on plane. But if there is a technical flaw in his swing, then adding power to the swing will tend to exaggerate the flaw. And the player who continues trying to add strength and power to the flawed swing will simply get out of whack (for lack of a better term). But an athlete who is executing a skill with “perfect” technique can continue to add strength and power to the skill, without having the skill break down, up to (and in theory even beyond) the limits of his strength and power. 6. 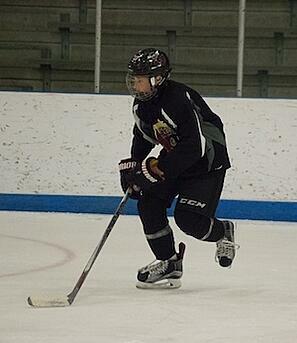 To maintain proper technique in hockey the athlete must be physically fit. Because the execution of every skill in hockey also requires that some level of power and/or strength be applied to it, some level of fatigue is inevitable. Thus a youngster going through a hockey drill can only sustain maximum effort for around 45 seconds or so. After that, he must rest and recover if he hopes to properly execute the skills in the drill without fatigue the next time through. And so being physically fit, i.e. so that the player can fully recover between each skill-based repetition, matters a lot to skill development. Because quality repetitions are the key to mastering any skill. How to Get 37 Weeks of Hockey Camp! The school year of most elementary and middle schools comprises 37 weeks of school over a 41-week time frame. This is likewise true at Bridgedale Academy. 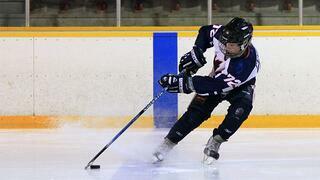 But for the serious young hockey player, there is a big difference at Bridgedale Academy. Because, as part and parcel of our core academic/athletic development curriculum as a youth hockey prep school, all Bridgedale Academy student-athletes receive the equivalent of 37 weeks of hockey camp conducted by 200 x 85, arguably the top youth hockey development program in North America. The training that our student-athletes receive at Bridgedale is specifically designed and overseen by 200 x 85 to manage the balance between hard work and recovery, so that fatigue is minimized and development of skills is maximized. The results we have seen over the years are undeniable, and we are confident that you can ask any parent of a Bridgedale student-athlete and you’ll get the same response: my son’s development at Bridgedale has been amazing. and the combination is unbeatable. Attending a school for athletes like Bridgedale Academy is the best of both worlds. It is literally the "best possible developmental environment" in which you can place your son. And this should be what guides your decision-making process.